Love it really nice piece. Yes definitely worth the money. All of our necklaces for men are kept in stock. Get creative and explore our vast selection. You can use the filters below to search through the many varieties in materials, colours and sizes. You will find a wide selection of necklaces for men in both leather and steel, plus many of the most popular models like dog tag, rosaries, key hangers and Thor hammer necklaces. 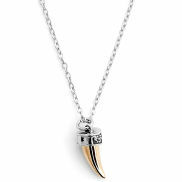 Steel, silver or gold are the classic necklace materials for adult males. They are available in many different sizes, with or without pendants. Under each product you can see the thickness of the necklace itself, typically from 2mm to 10mm. All of our steel necklaces are made from 316L stainless steel, better known as surgical steel, which is the best steel available for making jewellery. A necklace made from natural materials always has a more casual look. In this category of leather necklaces, you will find necklaces with cotton strings and leather strings sometimes with pendants made from real bone. Leather necklaces should not be worn with business suits or dress shirts, instead they are designed to go with a t-shirt or even shirtless for those summer days at the beach. It can be difficult to judge what length you really need, especially with a steel necklace. 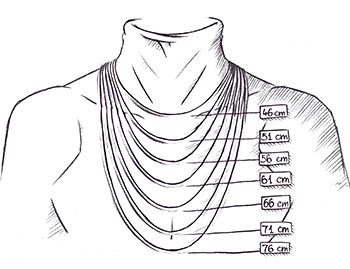 In the picture below, we have outlined the most common lengths of necklaces. The model is a young man with medium build. 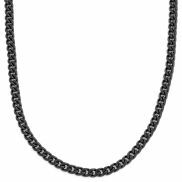 We supply steel or iron chains of 80 to 90cm with all of our necklaces with pendants. 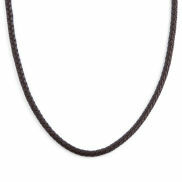 Today, necklaces for men are made in different forms and shapes other than classic leather and steel styles.. Fashion changes all of the time and one of the newest trends is rosary necklaces. Introduced 10 years ago, they are still as popular today. Another more recent fashion trend is the wooden pearl necklaces that have to be very long so that they can hang further down oneâs torso.